Headers and Signal Words—The signal words must alert people in the area to the potential risk or danger. The ANSI guidelines include 5 specific signal words: “danger,” “caution,” “warning,” “notice,” or “safety instructions.” There are specific guidelines for when to use each of these different words, and what color should be used with them. They are an indication as to the level of the risk, and how definite the potential risk can be. 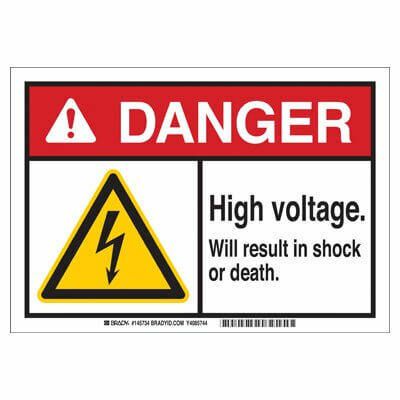 For instance, “danger” indicates the presence of an immediately hazardous situation that if not avoided, serious injury or death will occur, whereas “caution” means that a situation is present that could cause minor or moderate injury. Safety Symbols/Pictograms—These are images that go along with the warnings to quickly and easily convey the potential hazard that is present in a situation, and help to overcome any language barriers. ANSI’s guidelines include 4 different types of pictogram: hazard, mandatory action, prohibition, and informational. Hazard symbols show a visual representation of the actual danger or risk. Prohibition signs include a red circle with a 45 degree red band going across an image of the element that has been prohibited. Mandatory action symbols are blue, and they contain the action which must be avoided or taken (such as putting on safety goggles). Informational symbols show the location of safety devices, such as a fire extinguisher, an AED, a first aid kit, an eyewash station, and more. Sign Legend—These describe the hazard or the policy that the images and the other two elements are referring two. Depending on your industry, there is some variance between ANSI and OSHA standards, so always double check with your industry guidelines to make sure you are following protocol for proper safety and legal guidelines. Aside from the safety signage required by law, there are a lot of other signage solutions you can implement at your manufacturing facility. These solutions can improve your security and productivity by standardizing workflow. A manufacturing setting is a great opportunity to have instructional signage in place to remind people about the proper protocol. 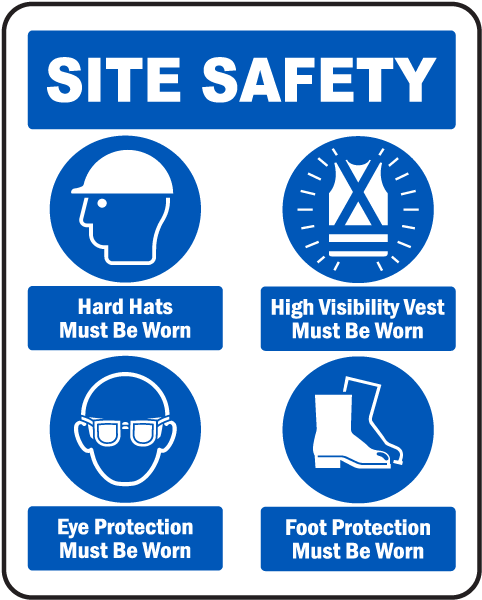 This can include signs that remind people of procedures (for example, reminding people to turn off equipment when finished, or reminders of areas where a helmet or safety glasses must be worn) as well as signs that show where items go (such as forklift parking space signs). Another really useful type of signage is warehouse navigation signage, where different areas of the warehouse or rows of shelving are labeled to make it easier to find items quickly. You can even use signage to show “lanes” and “roads” of where your forklifts and other heavy machinery should be driving. Anything that you can do to make processes more fluid and intuitive will improve your productivity and your bottom line. Another important use for signage in your manufacturing facility is employee morale. Certainly anything that makes the processes easier to follow will improve the morale of your employees. But you can also install specific signage to help positively influence company culture. 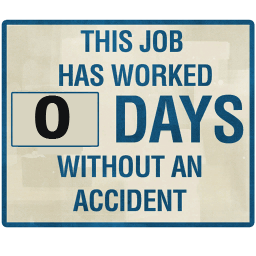 Signs tracking how many days have passed since your last workplace accident can help reward and incentivize employee safety behavior. Acknowledging and celebrating safety is a great way to unify your staff and help them to know that their attention to safety is important and that it has not gone unnoticed. At Starfish Signs, our team is well versed in the legal requirements of signage for a variety of types of workplaces. Plus, our experience in manufacturing signs, coupled with our attention to detail and our dedication to customer satisfaction will allow you to confidently invest in signs that will improve safety, efficiency, and morale at your manufacturing facility.